Nancy Tait was a remarkable woman. Nothing in her Enfield upbringing or early career presaged the emergence of a grassroots activist; that she became one was due almost entirely to the completely unscrupulous and ruthless response of the authorities to her husband Bill's asbestos cancer, mesothelioma. At a time when occupational illness was an accepted fact of life, she had the temerity to insist that Bill's death from mesothelioma (1968) be officially recognized. Throughout her prolonged interaction with officials from the Post Office, Bill's former employer, her tenacity, methodical nature and intelligence overcame a succession of bureaucratic obstacles. Four years after Mr. Tait died, the state-owned company was forced to acknowledge that it had indeed been responsible for exposing the telecommunications engineer to the hazardous substance which caused his death at 61 years of age. Working with staff at the Society for the Prevention of Asbestosis and Industrial Diseases (SPAID), which she founded in 1978 and which was later renamed the Occupational and Environmental Diseases Association (OEDA), Nancy became the world's first citizen's champion for the rights of asbestos victims. As the SPAID representative, she provided practical assistance for the injured as they attempted to traverse the bureaucratic minefield. Appearing at countless coroner's inquests, she supported grieving relatives whose loved ones had died from asbestos disease: thousands of lost husbands, wives, mothers, fathers. On many occasions, she crossed swords with industry spokesmen and industry-friendly experts; often, it was her evidence that was accepted. you can see a lot of fresh problems are coming up. Mrs. Tait was certainly one of the fresh problems; UK asbestos leaders such as Turner & Newall, Cape PLC and British Belting Asbestos all experienced the inconvenience of being the focus of Mrs. Tait's attention. Nancy picked up on the epidemiological trends well before statisticians and government bureaucrats; the experts, who frequently rubbished her findings, were eventually forced to admit she was right. In its heyday, the OEDA offices in Enfield were bustling with clerical staff and lab technicians. The work they produced was used to good advantage in cases brought by asbestos victims and for numerous submissions to government enquiries, briefings for Members of Parliament and opinion papers for bodies such as the Industrial Injuries Advisory Council. Even when the OEDA offices closed down (2008), Nancy did not retire  woe betide the person who said that she had! During the second half of her life Nancy went from being a meddling amateur, as one asbestos defendant described her to a highly-esteemed national figure receiving an MBE in 1996 and an honorary doctorate from the University of Southampton in 1999. Four years ago, the Sypol Lifetime Achievement Award was presented to Nancy at a prestigious London event by the Institution of Occupational Safety and Health. What I remember most was her messianic fervour on behalf of asbestos victims and her single-minded pursuit of their cause; small talk was not engaged in with Nancy, you either contributed to her store of information on asbestos or you sought her help, always willingly given. 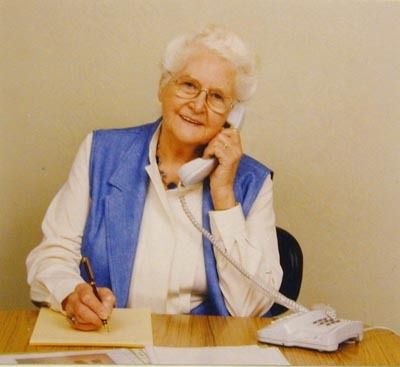 Nancy Tait was a pioneer in the field of asbestos victims' rights, having devised many of the practices and arguments still being used today. She was a resolute champion of those disadvantaged by asbestos disease and a fierce opponent of corporate skulduggery and government flimflam. Ironically, the destructive forces which created this accidental activist helped make Britain a better place. 1 Born February 12, 1920, died February 13, 2009.